Risingbd Desk: Prof Stephen Hawking has called for leading nations to send astronauts to the Moon by 2020. They should also aim to build a lunar base in 30 years' time and send people to Mars by 2025. Prof Hawking said that the goal would re-ignite the space programme, forge new alliances and give humanity a sense of purpose. He was speaking at the Starmus Festival celebrating science and the arts, which is being held in Trondheim, Norway. "Spreading out into space will completely change the future of humanity," he said. "I hope it would unite competitive nations in a single goal, to face the common challenge for us all. "A new and ambitious space programme would excite (young people), and stimulate interest in other areas, such as astrophysics and cosmology". He addressed the concerns of those arguing that it would be better to spend our money on solving the problems of this planet along with a pointed criticism of US President Donald Trump. "I am not denying the importance of fighting climate change and global warming, unlike Donald Trump, who may just have taken the most serious, and wrong, decision on climate change this world has seen," he said. 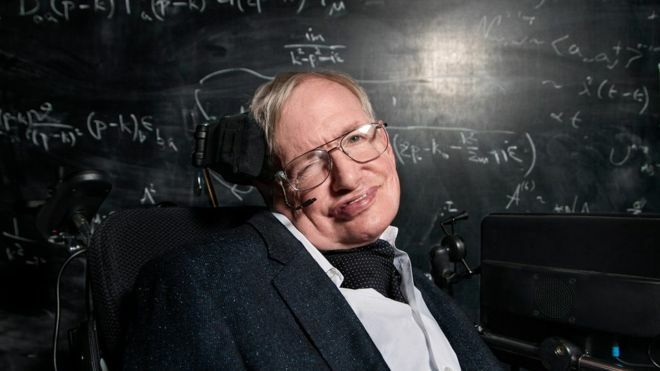 Prof Hawking explained that human space travel is essential for the future of humanity precisely because the Earth was under threat from climate change as well as diminishing natural resources. "We are running out of space and the only places to go to are other worlds. It is time to explore other solar systems. Spreading out may be the only thing that saves us from ourselves. I am convinced that humans need to leave Earth," the Cambridge University theoretical physicist explained. The head of the European Space Agency (Esa) Jan Woerner has said he envisages the construction of a Moon base to replace the station in 2024 and is collaborating with Russia to send a probe to assess a potential site. China has set itself the goal of sending an astronaut to the Moon. Nasa has no plans to return to the Moon, instead focusing its efforts on sending astronauts to Mars by the 2030s. Though if other space agencies begin to collaborate on constructing a lunar base it would be hard to see Nasa not participating. Prof Hawking said that there was no long-term future for our species staying on Earth: it would either be hit by an asteroid again or eventually engulfed by our own Sun. He added that travelling to distant worlds would "elevate humanity". "Whenever we make a great new leap, such as the Moon landings, we bring people and nations together, usher in new discoveries, and new technologies," he continued. "To leave Earth demands a concerted global approach, everyone should join in. We need to rekindle the excitement of the early days of space travel in the sixties." He said that the colonisation of other planets was no longer science fiction, though he did pay tribute to the genre in his closing remarks. "If humanity is to continue for another million years, our future lies in boldly going where no one else has gone before. "I hope for the best. I have to. We have no other option".